Living in an apartment without air conditioning is rough during the summer. One of the worst parts about it is sleeping. It’s so hard to sleep comfortably when you’re sweating like crazy. This summer is almost over, and I wish I had known about the Purple mattress earlier. It’s comfortable and cool, but is it worth the cost? We’ve created a Purple mattress review to help you decide for yourself. 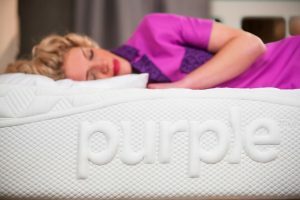 The Purple® Pillow turned so many heads that the company is now making the startup into a legitimate big-time mattress retailer. Their pillow raised $2.6 million on Kickstarter, and they’re using the same technology in their mattresses today. Currently, the Purple mattress is flying high in the face of their memory foam competition. They are cooler and more supportive than memory foam. In fact, Purple says that memory foam is a thing of the past. To achieve the formula that’s been taking the mattress industry by storm recently, they use Hyper-Elastic Polymer™ which creates a strong and breathable mattress top. This not only helps to eliminate that sweaty feeling so many of us get in the morning, but also being arranged in grid formation provides support no matter how much you weigh. So far, this mattress seems best for people who want a breathable, cooling, firm bed to sleep on. It’s not too firm, but firmer than most mattresses on the market, and is most likely going to be very popular with those people who suffer from back pain. Additionally, if waking up in a pool of sweat is your biggest problem then this will probably be the right selection for you. These mattresses are far from just a gimmick; they provide benefits where others fall short. For this Purple bed review, we’ll take a look at some of the more prominent features of their mattresses. Hopefully, you’ll see something you like, or alternatively, you may decide this isn’t the bed for you. The top layer (also known as the comfort layer) consists of a 2-inch thick layer of Hyper-Elastic Polymer™, which in a nutshell is what all the fuss is about. More on this later. The middle layer (also known as the support layer) is 3.5 inches of polyurethane foam. Finally, the bottom layer (widely referred to as the base layer) is 4 inches of polyurethane foam. Both of the latter layers of foam are CertiPUR-US­® Certified. So, now we know the contents of the core inner structure, let’s take an in-depth look at the features, pros, and cons of this mattress. A lot of people, myself included, often wake up feeling gross and sweaty when sleeping on a traditional viscoelastic memory foam mattress. Sure, they’re comfortable, but there’s nothing nice about waking up with that sticky feeling of needing a shower. I had been searching for a good quality mattress to get rid of this feeling, and it seems the Purple mattress is finally the one. Airflow is the best and most notable feature of the Purple mattress which is thanks to the breathability it has. They use a polymer top that allows air to flow through the core without trapping moisture. The technology used here distributes weight while allowing air to flow freely through the top. If sleeping on a cool mattress for regulating body temperature is your primary objective, then I think you would be hard pressed to find a better product. The air pockets within have the added benefit of not trapping moisture. This feature should also make the mattress last longer, though I can’t yet testify to that claim. It’s too early to tell if the Purple will last longer than others, but it indeed works when it comes to keeping you cool (and comfortable) throughout the night. Most of the other technologies to date take a back seat to Purple when it comes to airflow and cool sleeping. You’ll be hard-pressed to find another non-gel foam mattress in this price range that can offer the same cool feeling that a Purple mattress can. 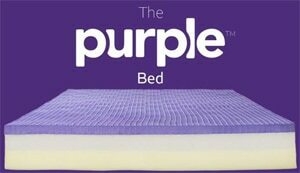 T he Purple mattress is better known as a success especially for people who prefer added firmness in their bed. The brand markets itself as firm but soft, with the ability to cradle your hips comfortably while providing ample support. This claim is factual to an extent, but the mattress falls further to the firm scale as opposed to the soft. The Hyper-Elastic Polymer™ (more on this below) disperses your weight as you sleep. This feature brings more cushioning to your heavier areas while firmly supporting your back and shoulders. If a chiropractor or other healthcare professional has recommended a firmer mattress to solve your back issues, and you sweat a lot when you sleep, you could probably kill two birds with one stone by picking up a Purple mattress. Multiple bedroom-based shortcomings can cause back pain. If your mattress’ softness is the cause of your back pain, this product may fix your problem. In terms of sleeping position, the Purple mattress is likely best for those who sleep on their back or stomach. The brand markets to back and side sleepers, but as research found from some of the side sleepers out there, we found that these are the people who complained most about the overly firm support. The Purple mattress is well equipped to deal with the issue of motion transfer and successfully displaces movement as not to disturb your partner while they sleep. Getting up in the middle of the night and waking the person next to you is a constant problem that mattresses try to address with different patents, often not achieving the desired result. With the Purple mattress, you can feel some slight movement while someone next to you is moving around, but it probably won’t be enough to wake you from a deep sleep. Then again, you’re always going to sacrifice something when you’re looking for a new mattress. The main feature of the Purple mattress is a comfortable, cool sleep. If that’s all you want in a bed, then you probably won’t be disappointed. The feature that makes all of this possible is Purple’s patented Hyper-Elastic Polymer™. Your body’s pressure disperses across the columns which are set out in a grid formation. In heavier areas, the mattress sinks. In lighter areas, it stays firm for extra support. This feature allows for natural spinal alignment, which is not only best for overall spinal health but will also help alleviate pain for those suffering from back problems caused by an old mattress. Of course, your experience on this mattress is going to differ based on your weight. Heavier users will naturally sink deeper than lighter users. No matter how heavy you are, though, Purple takes pride in the fact that their material doesn’t leave any body indentation. This feature is great because no one likes buying a new mattress every year. Regarding motion response, unlike some traditional memory foam mattresses that can make you feel stuck for a few seconds as you roll over, the Purple mattress responds to movement instantaneously. The Hyper-Elastic Polymer also provides a breathable base that’s temperature-neutral. It’s not cooled like gel foam, and nor does the inner layers feature any particularly special airing system, but it does a good job at not adding any extra heat that will make you a sweaty mess in the morning. The material Purple uses is what sets them apart from other brands. It’s most comparable to latex but far more breathable. Most of the time, we don’t even notice that we aren’t getting enough REM sleep. Waking up feeling tired and groggy can become normal. We often disregard this feeling, and say that we’re “not a morning person.” Of course, this isn’t a natural way to feel. If you’re getting enough hours and still feeling groggy in the morning, the problem most likely has something to do with your mattress. Purple mattresses claim to increase the amount of REM sleep you get by reducing tossing and turning and keeping you cool. When all of their features are combined, Purple helps keep the user asleep for longer. This feature doesn’t need any explanation. If you order the mattress and find that it’s not to your liking, then Purple will pick up the item and refund your money after 100 days. This type of flexible benefit is important because of the new and somewhat different technology Purple uses. In comparison, it’s innovation is different to many other mattresses on the market, and many people will love it, but some may not. If the latter is the case, then you can send it back before the 100 night period ends. It’s worth a try to see if the Purple mattress is for you. Whilst researching this product, I have taken a look at a ton of user reviews for this product, and most of them are quite positive. There are a few outliers, but most of the feedback told of a comfortable, cool mattress with firm support. As mentioned previously, the only negative reviews seemed to come from side sleepers. These reviewers appeared to think the mattress was too firm and didn’t sink enough. The rest of the crowd seemed to enjoy the support, and many people even claimed it alleviated back pain in only a short amount of time. 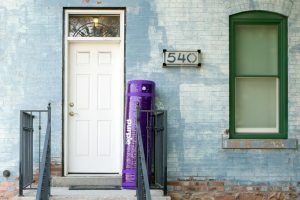 Some side sleepers wrote a positive Purple mattress review, saying it provided sufficient support in the right places. Comfort is subjective, but the general sentiment is that Purple delivered on their promises. Users who get hot when they sleep seemed to see especially positive results. The Ghostbed mattress is a suitable alternative for the Purple, especially when it comes to the cooling factor. It’s not as cool as a Purple mattress, but it’s cooler than many and is considerably cheaper. If you like the idea of a firm mattress that supports back and side sleepers, then Ghostbed might be worth the value. In addition to the cheaper price point, Ghostbed one-upped (literally) Purple by allowing for a 101 night trial period. In case you forgot, Purple only allows for 100 nights – quite the difference. In all seriousness, the Ghostbed is a suitable replacement for a Purple bed if you like the sound of a firm, supportive mattress. Cooling: Ghostbed offers a cooling feature as do Purple, but it isn’t as technically focused on this aspect of the mattress. If cooling is your primary concern, you’d probably be happier sticking with Purple. Feel: Ghostbed is another firm mattress, but from the user reviews it doesn’t seem to be as firm as Purple. There aren’t as many disappointed side sleepers here, so it looks to be a bit softer in the right spots. Price: Even without the $50 promo code, a Ghostbed is generally going to be a bit cheaper. Warranty: The Purple mattress has a 100-day trial, while the Ghostbed has a 101-day trial. This is comically similar, but Ghostbed outdoes Purple on the warranty side by doubling Purple’s 10-year warranty. Ghostbed has a 20-year warranty, so if you won’t have any durability concerns here. Our recent Leesa mattress review found that it is a softer, slightly cheaper alternative to Purple mattresses. Leesa is the most similar to Purple here, especially with its cooling layer of channeled Avena foam. Like Purple, Leesa helps to solve the problem of waking up sweaty. Unlike Purple, though, it is a variant of foam and is quite soft. If you like your mattress on the firmer side, you may want to stick with Purple or Ghostbed instead of Leesa. If you’re a side sleeper who thinks the other options will be too firm, then Leesa might be the perfect selection. Without any promotional offerings, Leesa is cheaper than Purple by a couple of hundred dollars. Cooling: Leesa focuses on cooling using innovation and new materials, as do Purple. They are both unlikely to run hot. Feel: Leesa is a lot softer than Purple, which can be great for some people and bad for others. This preference will depend on your sleeping position, and where you prefer your support. Price: When comparing a Queen size without any discount or promo code applied, Leesa is quite a bit cheaper when compared to Purple. Warranty: Both Purple and Leesa have a 100 night trial period with a money-back guarantee as well as a 10-year warranty. Tuft and Needle is, barring promotions, the cheapest alternative on this list. It boasts many of the same qualities as the Purple mattress concerning motion isolation, support, and comfort. Its adaptive foam is breathable and prevents you from sinking into the mattress and getting too hot. It’s received mostly positive reviews, primarily because of how useful it is for back pain, and how affordable it is compared to the rest of the field. Like the Purple mattress, the Tuft and Needle reacts to the heavier sections of your body. It disperses weight accordingly, though it isn’t as proficient at this as the Purple mattress. Cooling: Tuft and Needle will be the warmest bed on this list of alternatives. If the cooling factor of Purple hasn’t swayed you, then Tuft and Needle is probably the direction in which you’d want to look. Feel: Like with the Leesa, during our Tuft and Needle review we found it to be considerably softer than Purple. If you prefer a soft bed over a firm one, then one of these two will probably make a better choice. Price: Tuft and Needle is the cheapest out of the four compared brands. It’s still a quality mattress, so this won’t be a “you get what you pay for” type of situation. Warranty: Tuft and Needle has the traditional 100-night trial and 10-year warranty, just like Purple and Leesa. In conclusion of our Purple mattress review, we say that this product is ideal for people who are looking to get a longer, cooler night’s sleep. It’s firm and supportive but is perhaps more suited for back and stomach sleepers than side sleepers. 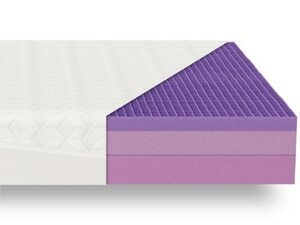 The innovative Hyper-Elastic Polymer is unique to the Purple mattress and disperses weight for a comfortable sleep; no matter how big or heavy you are, this universal adaptive feel does the job very well. It also provides a cooling effect that is virtually unrivaled by the alternatives, which is achieved without using gel foam or any other common method. For more information on the science behind it all, go to their website to find out about the Purple Bed for yourself. If you’re already convinced that this is the mattress for you, visit the official site and get your very own. None of the mattress listed seem to offer the Full XL option. I’d love to try a Ghost in this size but where do you go to find it? Unfortunately a Full XL is a slightly harder size to come across than others and not all manufacturers offer it. Try your luck here, hopefully you find something to suit your needs.